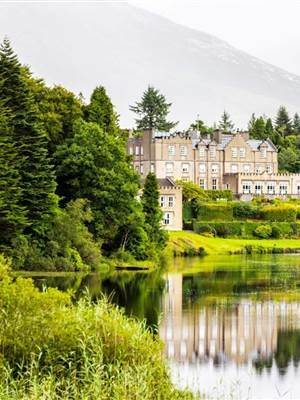 Afternoon Tea at Ballynahinch Castle is both a traditional high tea and a showcase of Connemara’s finest products, using the best seasonal produce available. 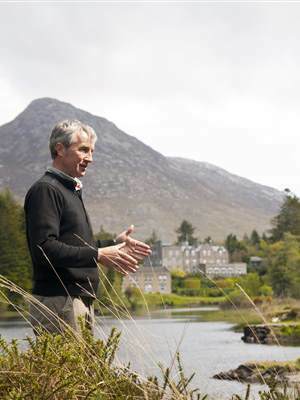 To compliment the finest local flavours, we have partnered with Galway-based master tea blender Jorg Mueller of Solaris Tea who has helped compile the loose tea menu at Ballynahinch, including the signature house tea blend using foraged herbs from the Twelve Ben Mountains. A combination of traditional finger sandwiches and signature open sandwiches, the Afternoon Tea menu features egg & watercress on Irish soda bread, crayfish, dill & cucumber on sourdough, coronation chicken on walnut & treacle loaf, and Connemara lamb with mint yogurt dressing on sourdough. Sweet treats include everyone’s favourite, scones, both plain and fruit, with a selection of homemade jams and clotted cream, along with rose and raspberry macaroons, berry tartlets with crème pâtissière, milk chocolate mousse and mini Pavlova with seasonal fruits. With the Ballynahinch signature black tea – a unique black tea blend containing locally foraged ingredients such as juniper berries, horsetail & oat straw giving the blend a light and playful aromatic top note. Served in the Owenmore Restaurant with it’s beautiful river views, every Saturday & Sunday from 1 p.m. to 3 p.m. and costs €25 per person, or €40 per person with a glass of champagne.